The Toshiba Satellite C870-198 is an entry level 17.3" display laptop, offering the latest Intel Core i3 - 2328M processor running at 2.20GHz, 4GB of DDR3 RAM, a huge 500GB hard drive, and a copy of Windows 8 all for under £400 - which on face value is a pretty competitive specification. But how does it work in real life? In our review we test the 17.3" Toshiba C870-198 and see if it is worth purchasing over it's similarly priced rivals. 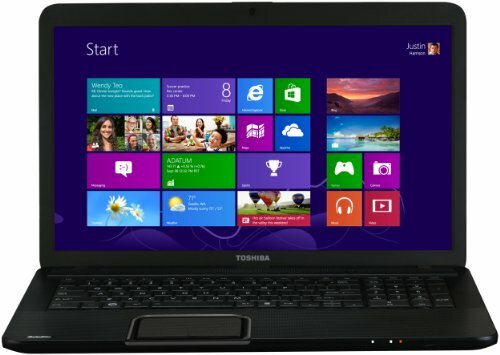 Below is our review of the Toshiba Satellite C870-198, a 17.3" laptop, featuring 4GB RAM, 500GB hard drive and Windows 8. Buying a 17.3" laptop has it's advantages - more comfortable to work in front of, better for viewing media, yet still portable. However it also has it's disadvantages, particularly in the lower price brackets. Firstly it will be heavier and larger over a 15.6" equivalent. Secondly battery life will not be as good - larger screen equals more power used. Thirdly the extra screen costs more money to manufacture - so the rest of the specification will typically be lower as a result. With that in mind, how does this 17.3" notebook measure up? Inside you'll find the Intel Core i3 - 2328M running at 2.20GHz, complete with 4GB RAM - keeping the installed latest Windows 8 operating system running fast. 500GB hard drive offers a substantial amount of storage, which will be more than enough for the vast majority of laptop users. The exterior is all in black, with a slightly textured design - and the interior follows suit in a stealth black. It doesn't look flashy, but also had the added bonus of not looking dated - it should age well in terms of design. The full size keyboard is easy to type on, and feels comfortable - with the touch pad situated slightly to the left hand side of the laptop, in line with the centre of the keyboard. To the right you'll find a full sized number pad, which should please those who have regular numerical input, such as accountants. The two buttons on the touch pad work well, and have a nice action. It features 3 USB ports (2 x USB 2.0, and 1 x USB 3.0), HDMI out, Ethernet and VGA, as well as headphones, microphone, card reader and DVD - enough for the vast majority of users. So who is this laptop aimed at? At 17.3" inches, it's probably a bit large for those who wish to commute every day - but it is still portable enough for those who wish to have a notebook to work away from home with. The larger screen makes it ideal for students - portable enough to take away to university and college, yet the screen is large enough to double as a media centre. Pros: Decent screen, fair specification, all in all pretty good for the price. Cons: Less portable than a smaller 15.6" equivalent due to increase in size and weight. Good cheap all rounder - slightly slower than some other smaller but higher specification laptops in this price range, but for a budget 17.3" laptop, the Toshiba Satellite C870-198 offers very good value.